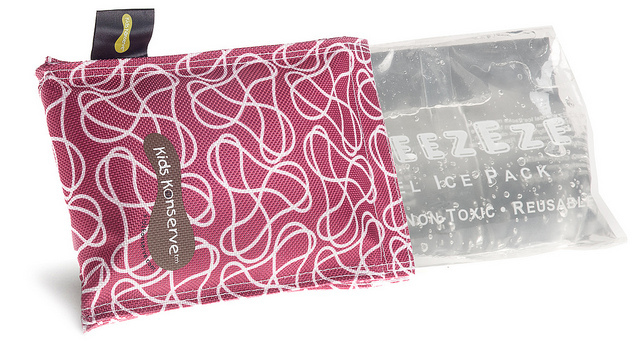 A non-toxic ice pack with a sweet-free cover made from recycled plastic bottles. Keep your lunch or your groceries cold. BPA-free, PVC-free, phthalate-free and lead-free. This U-Konserve Ice Pack has a non-toxic gel pack inside a cover made from recycled plastic bottles! This reusable ice pack is ideal for kid's lunch boxes, keeping baby bottles cold, and handy for boo boos. Pop in the freezer, place in your lunch sack, and it will keep your lunch cold for hours. Or carry with you in your reusable shopping tote to keep groceries cold on your way home.